Now you know why I asked for it to be linked here. French subject (25 pages wooohooo). Sorry, didn't see the request to post the link here. Thanks boromir96 to make up for my lack of attention ! Its a little complicated for us to follow the discussions here, to repport back propositions, to follow discussions on the french forum... It create cross discussion hard to follow XD Hope my head will be hard enough ! The Mindflayer Mastermind is a neat but not often played unit. Illithids are iconic D&D monsters and deserve greater representation in Heroscape. How does Cxurg'gyath by Tolamos fair? Balance is one of my primary concerns with this unit. His ("Her"? "Its", I guess) obvious cheerleader ability is the +1 to Enslave powers. Really, though, +1 isn't much of a boost for a power like Enslave, which is not used all that often in a game. I found that with two Masterminds I would be lucky to get a dozen Enslave attempts, making it close to a 50-50 whether or not Enslave Enhancement would affect a game. It sure is nice when you roll that 16, though successful Enslaves usually aren't game-breaking. Cxurgy's other main ability, Psionic Explosion Special Attack, is one of the nicest explosion attacks available, not harming friendly units and not requiring line of sight. The low range really hurts, however, and explosion attacks can come cheap: 65 points for Johnny Shotgun or 90 points for Heirloom's enemy-only version. Cxurg'gyath does have decent survivability with his 6 life and 3 defense. Lurk in Shadows does not come into play much; even on maps that have shadow tiles the lack of a long-range attack means it is easy for enemy units to close in and attack him from an adjacent space. As a combat figure I put him in a class with Heirloom. Perhaps slightly better, though not 50 points so. Is the cheerleader ability worth the remaining points? I did a lot of playtesting to determine that. Mindflayers are cool, iconic, and deserving of more representation in Heroscape. Cxurg'gath fits very well in terms of theme, boosting his fellow illithids and providing a more powerful version of their special attack. The figure also looks fantastic. An upgraded mental blast and an enhancement to other mind flayers is not especially creative, but I don't hold that against it. Quite the opposite: this unit is all about theme and boosting some underplayed units--this design is exactly what the unit should be. Besides theme, reworking and reusing existing powers to make new units is one of the best ways to expand the game. 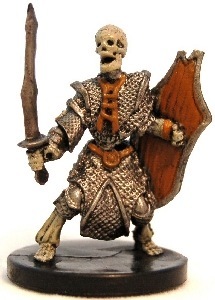 I found a handful of these minis at various online sites, but the important bit is that this is a Reaper miniature, which as far as I can tell is still in print. 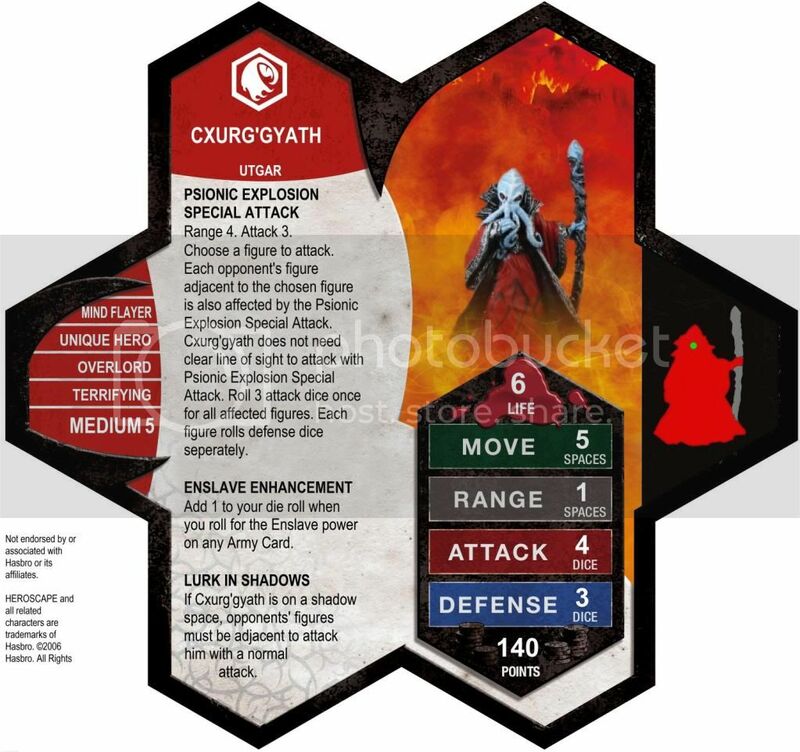 Cxurg'gyath is a figure with an explosion attack and an Enslave boost. While his explosion attack is arguably better than others, due to the cost of the unit I would generally prefer to buy a cowboy if I wanted an explosion attack in my army, or Heirloom if I wanted an enemy-only version. The real reason to buy Cxurg'gyath over the others is the Enslave enhancement. One could argue a case for Lurk in Shadows, but in my experience enemy units could usually close in on Cxurgy and attack it if they wanted to due to the short range of Psionic Explosion. Making the unit only really valuable with Mind Flayer Masterminds isn't really a problem; in fact I welcome a new reason to bring the Masterminds to the table. In testing I always ran Cxurgy with one or two Masterminds. I found Cxurg'gyath to fun and interesting, particularly as a bad guy in dungeon crawls and in other formats as well. I ended up playing Cxurg'gyath against an Elf Wizard army multiple times because of how fun it was. Against them the mind flayer group was particularly effective, as one would expect. In general, however, I found Cxurg'gyath to be on the high side for points. Lurk in Darkness, even on maps with shadow, rarely comes into play because of Cxurgy's short range. It's species, Mind Flayer, actually works against it, because Mind Flayer Masterminds are unable to Enslave Cxurg'gyath. There were numerous times where I wished I could to get off a well-timed explosion, or get any sort of activation when there are no enemy heroes nearby. I personally felt Cxurg'gyath was 10-30 points too costly. While I did not find Cxurg'gyath to be a particularly effective use of 140 points (especially considering that at least another 100 points need to be spent on a Mind Flayer Mastermind to accompany him), the design is fitting and I found it fun and interesting to play. I admit I waffled on this vote for some time as I feel that 140pts is on the high edge of what I consider acceptable pricing. In the end, I'm not judging a unit on tournament capability but overall playability. Cxurg'gyath is expensive but does what he is designed to do sufficiently, and is a really neat baddie in a dungeon crawl (he'd make a great "boss" villain for a room, like Othkurik). Perhaps someday some new units will make him even more valuable. I vote to induct Cxurg'gyath in the SoV. Last edited by Scytale; May 30th, 2012 at 08:35 PM. dok's Gargoyle is a screening unit, an area that is not heavily mined in Heroscape and generally dominated by Deathreavers (with some builds using Gladiatrons and Sentinels in that role). Being very different than Deathreavers and much more affordable than Sentinels, I was interested in giving this unit a try. There is not a great comparison to the Gargoyle in a similarly-costed unit, but other Common Heroes around that price point compare fairly. Four move, 3 attack, and 4 defense are weak stats for a single-activation unit (even with flying), but the Gargoyle's real value is in its use of Stone Form. At times I felt it was ridiculously hard to kill for 30 points, but that's how it should be for a unit that is not made to serve any other purpose. The Sentinels of Jandar provide a decent comparison, which are 110 points for three figures instead of 30 points for one figure with similar stats and role. The additional 20 points for the Sentinels is more than fair considering you get to activate three figures instead of one. In terms of abilities, the theme is fantastic. A Gargoyle turning to hardened stone when not active is spot-on. I really like the concept of a Common Hero that is useful as a screen or glyph-grabber, and a gargoyle is a perfect fit. Stone Form is a clever concept that naturally limits the figure so that they operate optimally in small numbers. 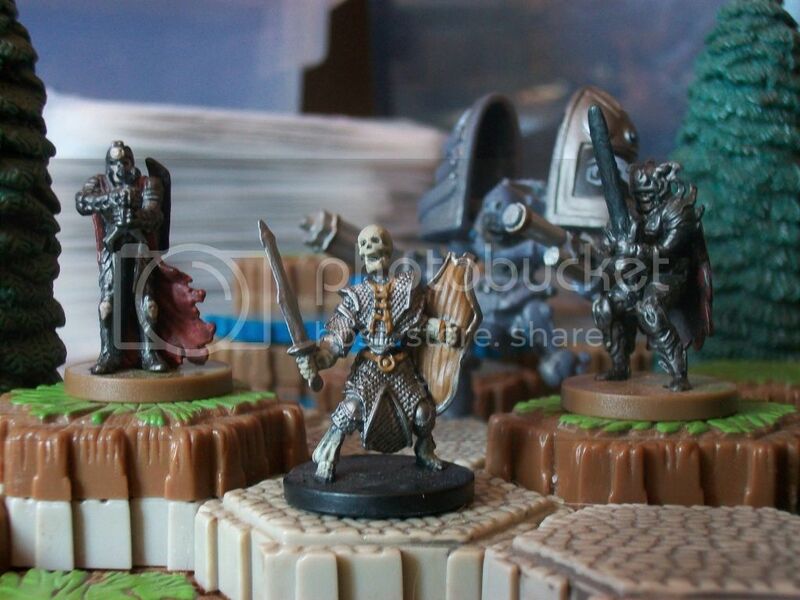 While I did prefer the original D&D miniature used, the Reaper miniature is, I believe, still in print, and therefore has acceptable availability. The Gargoyle is limited in usefulness due to Stone Form; without it, it's an overpriced single-activation figure. Thus is it not useful in large numbers nor is it particularly effective at cleanup (though Flying does help with that somewhat). The two things it is capable of are holding glyphs and working as a screen, especially in choke points. I focused my testing with that in mind. The primary issue to consider with any low cost (30 points or less) unit is order marker value. The unit needs to provide enough value to spend a precious turn activating. Some do so with free activations such as bonding (Swogs, Elementals, etc), with a heavy attack (Sahaugins, pre-Death Knight Dumutefs), special abilites (Drow Chainfighters), or as cleanup filler when anything will do (Marcu, Isamu). Gargoyles are valuable in that they do not require order markers -- at least not after they are in position. They do take order markers to get into position, and this is where I think they do not quite succeed. Gargoyles, whether used as glyph-holders or screens, require order markers very early in a game. Early game order markers are very precious for gaining and securing board positioning. In the games I played the Gargoyles were just too slow to get into position; I always felt my turns would have been better used gaining position with my main forces. They held out well once they got into position (in a "could die at any moment like a Deathwalker" sort of way), but by then I was already behind and was not able to take back the board control I gave up. Their slow speed of 4 (with Flying) is what holds them back; I may have felt differently if their move was even one higher. It may not seem like much, but even if the extra move does not decrease the number of turns to get to a destination it allows one to start with them farther back in the starting zone, or have the freedom to hide behind obstacles while waiting for the next order marker to be revealed. Yes, I used Warden 816 with them in some games, and I liked the Gargoyles better, but I felt that if I was going to drop 90 points on the Warden or play them only in specific Guard builds I wanted them to be a little more impressive. They do a bit better in scenarios where they don't need to move at all, such as Bridge to the Forgotten Forest in the Road to the Forgotten Forest set. However, even in those games I did not find them especially impressive; killing off the opponent's other units forces the Gargoyles out of Stone Form, making them vulnerable. Not every unit needs to be tournament-competitive, certainly, but a unit needs to provide sufficient value in point cost and order marker cost to see even casual play. This is especially true if the unit does not function well in the cleanup filler role. The Gargoyle is close, but just a bit lacking in what it intends to do, which sadly would leave it gathering dust. I really like the concept and the simple design. On paper it is interesting, but I found it to be frustrating in play. It's a little too slow to be worth using. I might feel differently if it was changed to 5 move, but for now I'm going to have to vote for the Gargoyle. Balance- I went through a bit of trial and error on this. 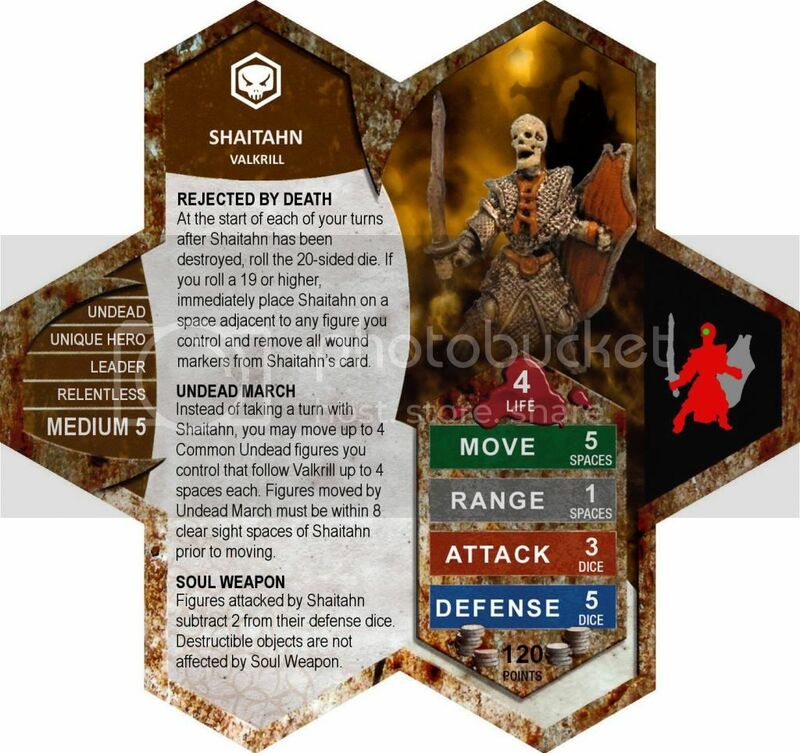 Originally, Shaitahn did not possess the Soul Weapon power, and we played him at 90 points. However, he lacked offensive punch, so we gave him Soul Weapon, and bumped him to 110. He seemed alright there, but every 1 in 3 games or so, he felt overpowered. So we began alternating 110 and 120 in playtests, and he seemed most balanced at 120. For that, you get a movement ability for certain figures, a twist on the usual offensive power, and the longshot ability to bring him back from the dead, which is good, because he's brittle in gameplay. He's limited by his less-than-stellar survivability, but boosted by Undead March and Soul Weapon. Rejected By Death is a factor in cost, but not so much as the other powers and stats. Life 4- He's a skeleton wearing chain-mail, so he should be brittle. He can take a blow in combat, but not many. Move 5- Matches that of his bonding squad, the Death Knights of Valkrill, and is appropriate for a figure like this, a typical melee hero of average cost. Range 1- That's right ladies and gentlemen, Shaitahn the Great will now use his Boomerang Sword for 10 range! No. He's a melee figure, carrying a sword. No explanation is really required. Attack 3- Mediocre, but it can be a potent tool when coupled with the Soul Weapon power. High-cost melee squads like Minions, and heroes/squads that rely on high output from little dice like Crixus and WoA hate this. But they already did when the Death Knights came along, so nothing revolutionary here. He is a bit better against Minions and squads like them than the Death Knights due to the extra attack die. Defense 5- This also matches his bonding squad, and contributes to his brittleness that makes you watch where he goes in gameplay. He'll take a beating from squad swarms, but luck can defeat him if faced with an angry Krug or another high-attack hero. Given his 4 life and the cheerleading/bonding hero role he plays in a Death Knight build, 5 defense is appropriate. It'll keep him alive, just not too long under constant pressure. Points 120- As I said before, 120 is right for him. He'll likely never take on Krug in single combat, but he gives enough aid to the Death Knights that he should considered equal to 2 squads of them. 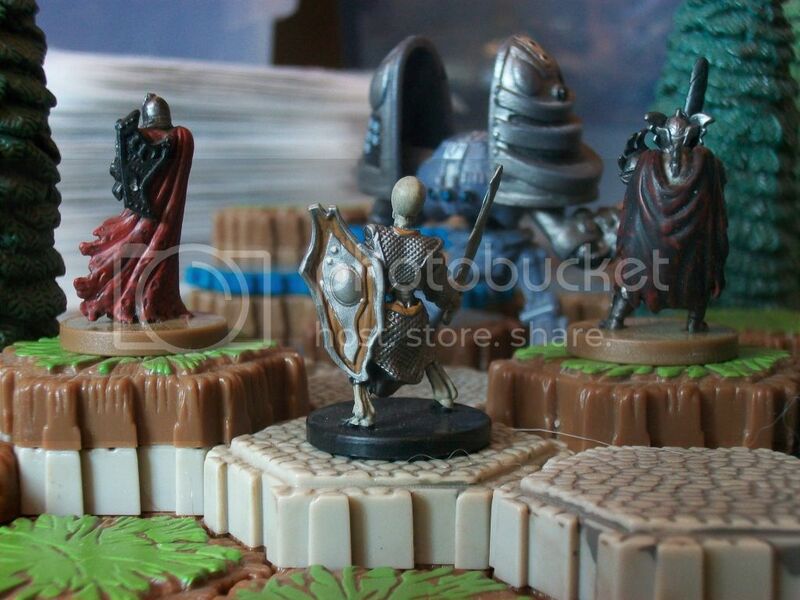 Shaitahn is a Medium 5 figure, and goes on a normal HeroScape single hex base. He is a skeleton wearing full-body chain-mail, toting around a large sword and a wooden shield. I'd call him visually distinctive, yes. Don't believe me? Check out the picture below in the Accessibility section. Creativity- As a figure that adds the role of Cheerleader/Psuedo-beatstick to a fledgling general’s armies, and gives new possibilities in movement to a squad that has trouble with mobility, I’d say he adds something new to the game. Another unprecedented move is the Rejected By Death special power in Classic ‘Scape, as opposed to Marvel. Beyond that, he adds to the Undead faction of Valkrill’s armies, which already has a solid base in Death Knights (who he works well with), and C3V’s Nicholas Esenwein and C3V’s Preyblood Thrall (who seem to do better on their own). Nevertheless, he makes the Death Knights slightly more independent of Unique heroes from other General’s armies, (Sir Hawthorne). And just to add to the theme, Shaitahn is a rough English phonetic spelling of the Arabic word for demon. No, he's not a demon, but the Arabic word for skeleton translates roughly to Haypal aderi, (not so scary) so this was the next best thing. Online miniature sites list about 60 at the moment, and ebay has approximately 30, for a total of about 90. The sculpt typically goes for $2.00 to $5.00, though usually stays on the low end of this spectrum. Here is a link to his abPrices page, and ebay search page. A couple of sites not listed at abPrices, such as alterrealitygames, carry the miniature as well. Last edited by Son of Arathorn; February 24th, 2013 at 12:37 PM. Reason: Card Image Fixed, sorry guys! Fair point. I'd definitely be okay with that change, since Shaitahn tends to not do so well with the only Undead Valkrill Hero, Nicholas Esenwein. He tends to work best with the Death Knights. I agree, making this Squad figures (maybe Common figures--maybe both) makes the most sense. Also, just to be clear, you intend for Undead March to not require an OM on Shaithan, so that with an OM on the Death Knights, I can first move 4 of them (4 spaces) and then move and attack with 2 of them, right? Of course. I think the reason that this issue of heroes never came up in playtesting it that, well, Valkrill doesn't have many heroes. And the one he does have already works in sync with a common hero that moves itself. So the question would be, do I want Nicholas ,X number of Thralls, and Shaitahn, or do I want Nicholad, X number of Thralls, and 4 extra Thralls? Something of a no-brainer. And since most of the playtesting was based in Death Knights and the occasional Thrall in a filler role, I see no problem making that change, it shouldn't affect the point balance at all. I'll contact awesomeunleashed for a new card, and we'll fix the nomination post, if that's alright. I'll make it Common figures, since a couple of my own customs work into this mechanic (see my custom Skeletal Archer for the best example). I'll make it Common figures, since a couple of my own customs work into this mechanic (see my custom Skeletal Archer for the best example). Yes, of course, I forgot about the Thralls. I like the idea of using this with the thralls too.